Summary: When we say that this dish is outstanding, we are not saying that lightly. This dish is so decadent and rich, that you will question whether or not it is truly vegan and gluten free. It is the perfect dish for Christmas, Thanksgiving, Easter, or any potluck you may be attending. Of course, we like it for any meal that needs a side dish. And to be honest, we'd eat the whole tray as dinner if we wouldn't feel like we were being extremely naughty. Start by soaking the cashews for an hour or two in water, enough to cover them completely. Then toss the cashews in a blender and keep adding water until it hits your desired creamy consistency. Use it in a 1:1 ratio in any recipe that you would regular cream. The rest can be frozen for a few months. Note: if in a hurry, you can get away with not soaking the cashews, they just blend much better, and are much creamier, if presoaked. In a 2-quart saucepan, bring wine (or lemon juice), vinegar and shallots to a boil over medium-high heat. You want to reduce it, so cook it for 4-5 minutes. Add cashew cream, salt and pepper, reduce heat to medium, and cook for another minute – stirring consistently to avoid burning. Reduce heat to medium-low and begin adding the chilled margarine a tablespoon at a time, while stirring constantly. Once all of the margarine has been completely mixed in, add 2 cups of the cheese into the pan and stir until melted. Remove the sauce from the heat. In a 9×9 baking dish, spoon a thin layer of the sauce (about 1/3 cup) into the bottom of the baking dish and spread around. Pour the broccoli into it, in an even layer. Pour the rest of the sauce over the broccoli, evening it out. 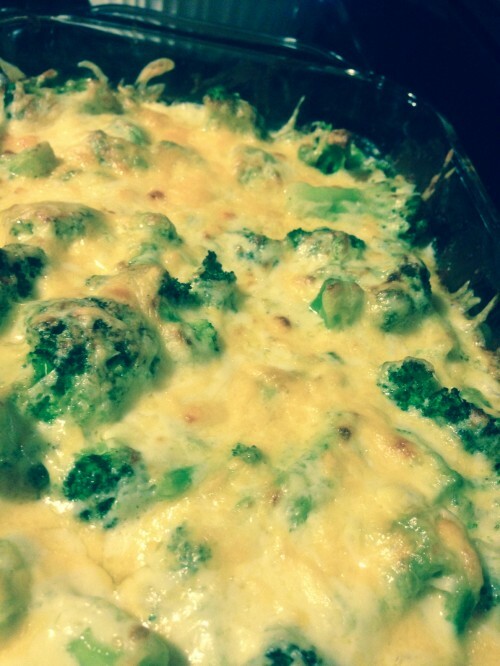 Take the last cup of shredded cheese and evenly sprinkle it over the broccoli. Place in oven and bake for 15 minutes. Turn the oven up to “broil” and bake until browned and bubbly on top. Pull out and serve. If you have any leftovers, they are excellent sauteed with some tofu in a tofu scramble. Delicious!